Cosmelan is a treatment that is used for depigmentation to treat cases of hyperpigmentation and melasma. Cosmelan fights hyperpigmentation by reducing the amount of melanin which causes the darkening of the skin. Cosmelan inhibits the functioning of the enzyme tyrosinase which induces skin darkening through melanin. When melanin synthesis reduces, the skin darkening automatically reduces and the skin gains a lighter coloration. The treatment has been effective in removing 95% of skin discoloration in most cases. Let’s see in detail what the Cosmelan treatment is. Cosmelan treatment targets skin hyperpigmentation or melasma where in the skin becomes dark in patches on the face and the neck due to production of excess melanin. The metabolic reaction that produces melanin needs the enzyme tyrosinase which processes tyrosine to produce dopa and subsequently processes dopa to produce dopaquinone. It is from dopaquinone that melanin is produced. Cosmelan Treatment inhibits the enzyme tyrosinase which is the building block in the formation of melanin. How Effective is the Cosmelan Treatment? Cosmelan Treatment is very effective in all kinds of melasma, be it on the surface or deep seated melasma. Pigmentation that could not be cured by regular topical skin lighteners can be cured by Cosmelan Treatment. It has a rapid de-pigmentation action. 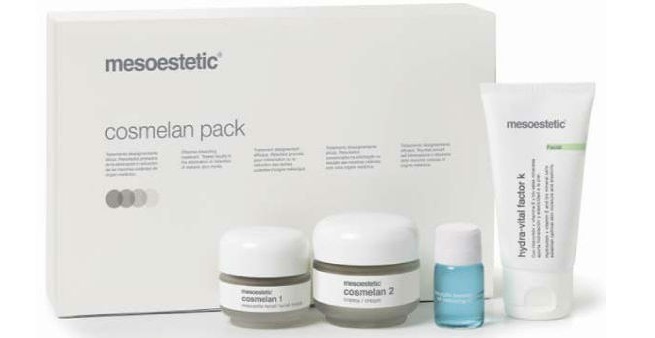 Cosmelan Treatment is suitable for all skin types since it does not have any hydroquinone. It has also shown remarkable effect in removal of acne scars. What does the Cosmelan Treatment involve? The treatment is a two part treatment- an in-office procedure that involves a peel off mask called cosmelan 1. The mask is applied by the physician after your skin is cleansed. The mask is yellow in color. It needs to remain on the skin for about 8 hours. Normally, the patient is sent home after application of the mask. The mask has Azelaic Acid, Kojic Acid, Ascorbic Acid, Phytic Acid, Arbutine and Titanium Dioxide. The mask can be removed by you at home with a cleanser. The second part of the treatment has home care products- a maintenance cream- cosmelan 2 and a Vitamin K cream. The Maintenance Cream has Titanium Dioxide, Kojic Acid, Ascorbic acid and Phytic Acid. The Vitamin K Cream has Hydroviton, Vitamin E and K, Amniotic Fluid, Silicone Oil and Glycerin. You would need to use these for two weeks continuously, and also never forget your sunscreen when you step out. After this, you would have to go for a consultation during which the home-care treatment will be extended for a period upto six months depending on how much your skin would need. What Results does Cosmelan Promise and how soon? In most cases, there is 95% reduction in the blemishes and pigmentation after the treatment. Within a week of the treatment, there is reduction in blemishes and the skin gets regenerated and becomes more luminous. At the end of the treatment, your melasma and other blemishes will disappear completely. The price of the treatment can vary between $500 and $1000. As with any peel, your skin may be sensitive for a couple of days after the peel. The skin may peel or flake up like how it does during extreme winter. This is normal. Do not peel or scratch the skin. Continue applying the home care creams. The Cosmelan treatment has been very effective for many patients. Its success also depends on your discipline in following the home care regimen and also making sure that you use a superb sun block to prevent further pigmentation.